Every year our church puts on a Children’s Christmas Program on Christmas Eve. The kids dress up as shepherds and sheep, angels and Wise Men, Mary and Joseph. The little ones are adorable and often funny as they recite their lines and sing their songs. A few years ago, however, I got into a little trouble with the Children’s Christmas Program. The first act featured a family on their way to Christmas dinner with grandpa and grandma. The two teenage daughters whined and complained the entire way because all their friends were going to a Christmas party that night, but they couldn’t go. The second act took place in grandpa and grandma’s living room. Grandpa was sitting on his rocking chair and grandma on hers. All the little children sat on the floor, as the two teenage granddaughters slouched on the couch, texting on their phones defiantly. As she did every year, grandma asked the children questions about the very first Christmas, allowing them to tell the story of Jesus’ birth. The two teenage granddaughters, however, never looked up from their phones. The third act took place a year later, once again in grandpa and grandma’s living room. The little children again sat on the floor; the two teenage granddaughters on the couch. 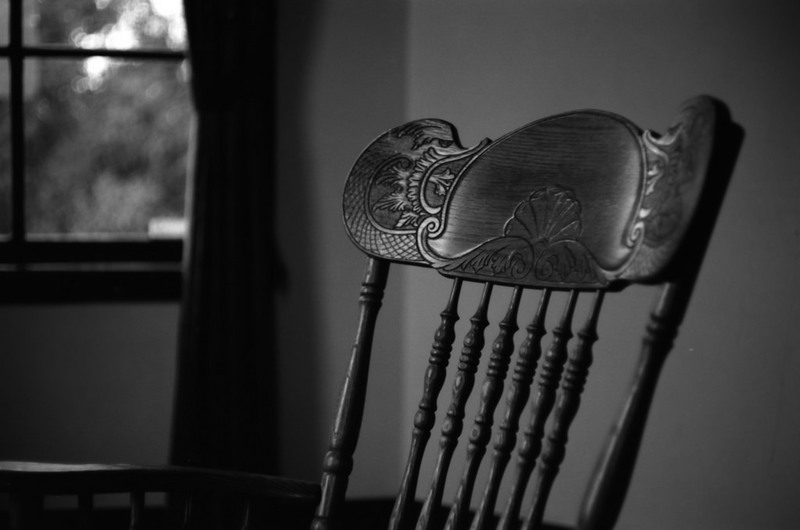 Grandpa sat on his rocking chair, but grandma’s rocking chair was conspicuously empty. The mood was somber. The teenage granddaughters sobbed with guilt. A few people weren’t too happy about that Children’s Christmas Program. It wasn’t cute. It wasn’t funny. I mean, who wants to talk about death on Christmas Eve? Yet you can’t have Christmas without death. Every year people die at Christmas. My grandmother died two years ago on December 23. Even when they don’t die right at Christmas, their absence is still sharply felt this time of year. Many homes this Christmas will feature an empty rocking chair in the living room. Death is a part of life in this world. It invades our Christmas celebrations. All of us, at some point, will feel death’s sting during the holidays. But that’s not why I say you can’t have Christmas without death. You can’t have Christmas without death because Jesus was born to do one thing. He was born to die. He was born in a barn in Bethlehem to die on a cross at Calvary. You already know Christmas isn’t about Santa Claus or Rudolph the Red-Nosed Reindeer. What some Christians fail to grasp is that Christmas also isn’t about a cute baby lying in a cute manger. Christmas is about God becoming one of us and taking his first steps to the cross. Jesus was born to die. He was born to die for your sins. He was born to die so that you could live with him forever in heaven. You can’t have Christmas without death. Yet Christmas isn’t about death. It’s about the life in heaven Jesus came to win for you. When we truly grasp that, it changes how we look at the empty rocking chair in the living room. I miss my grandma, but she is in heaven. I will see her again. Because Jesus was born to die, I am forgiven for every dumb and hurtful thing I’ve ever done. Because Jesus was born to die, I will live even though I die. That is the true joy and peace of Christmas. Christmas isn’t about a cute baby lying in a cute manger. Christmas definitely isn’t about cute Children’s Christmas Programs. Christmas is about God’s sacrificial love and the never-ending life Jesus came to win for you. But that means you can’t have Christmas without death.